Tshepi Vundla is a South African model, personal shopper, fashion stylist, and wardrobe organizer. She has been featured in many media outlets for her various success in the fashion industry which includes Woolworth’s for winning their Style by SA’s grand prize. She studied marketing at IMM. 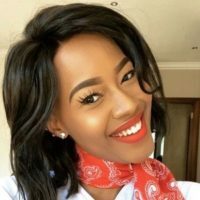 She was born on December 1990 in Johannesburg in South Africa. Her exact date of birth is not known but she is 28 years old as of 2018. She began studying fashion design at Lisof, but this didn’t seem to be her path. She was terrible at the sewing machine and really found it hard. Tshepi then tried Vega where she studied creative brand communications for a while and eventually dropped out. After noticing the importance of marketing around fashion and signed-up to do a correspondence degree through IMM on the subject of marketing. Tshepi started working the awards shortly after her enrollment at IMM. She started putting outfits together and things began to progress in her career. Tshepi actually started close to home by dressing her parents and sisters for awards and events. People gradually started to pick up on her style and especially on Instagram, Tshepi’s account started to really get noticed.